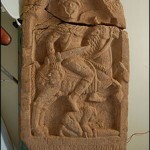 Contractors building an apartment complex in 2005 uncovered a unique Roman headstone from 100 A.D. with an intricately carved image of a Roman soldier holding the severed head of a barbarian. Stephen Bull, curator of Military History and Archaeology at Lancashire Museums Service, said there was a very good chance the stone depicts a real incident. 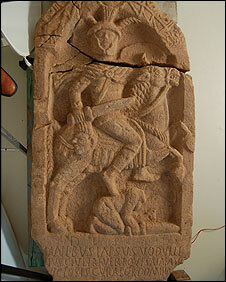 “The inscription tells us that the man was ranked as a curator in the Roman auxiliary,” he said. It’s funny, but I don’t think of beheading an enemy fighter and holding his head aloft as a particularly rare accomplishment in ancient battles. Perhaps it was, though. Certainly Roman swords were short jabbing things, not exactly suited to severing body parts. The stone needs restoration, but is scheduled to go on public display in the Lancaster City Museum by December.